John Lunn  dates the Tyldesleys' ownership of Garrett Hall to the 13th century and gives a firm descent for this branch of the family from Lambert Tyldesley who died in 1596. Garrett Hall, also known as Garratt Hall or simply the Garratt, was to pass into the hands of the Stanley family in the 17th century. 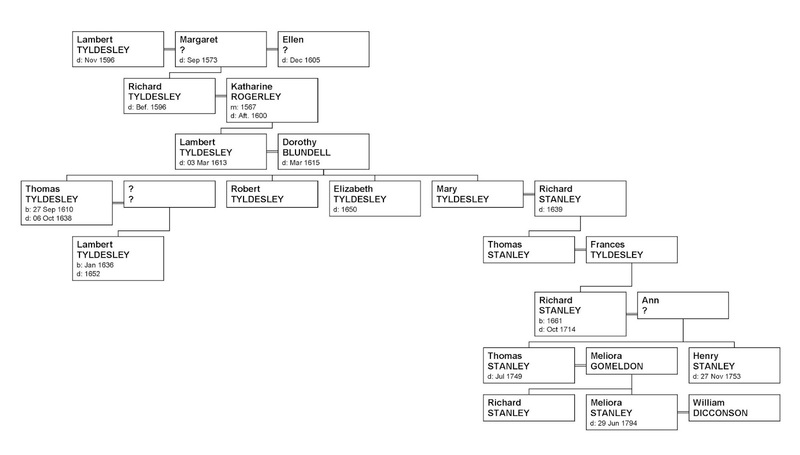 The last direct connection with the Tyldesleys was when Thomas Stanley of Garrett Hall married Frances Tyldesley. Frances Tyldesley was the daughter of the Sir Thomas Tyldesley 1612-1651 and Frances Tyldesley née Standish. 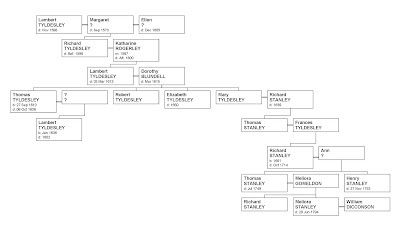 As indicated in a later post, a more complete pedigree was taken from Thomas Stanley at Preston on 19 September 1664 during the Visitation of Lancashire by Sir William Dugdale.